Here they are, in their crazy pajama outfits, enjoying their new fruit pouches. I gave them these, and pizza rolls for dinner, and both of them went right for the pouches, and didn't put them down until they were gone. I mean, C'mon, It's pizza rolls! But no, they wanted their fruit first because of how much they enjoy the taste. My girls are not the best at eating their veggies. They pretty much will only eat broccoli and carrots, and thats only if there is ranch to dip it in! Whenever I find something fruity that they hide veggies in, I'm all for it. Usually we do a lot of V8 Fusion (which is veggie and fruits), and now we have another option! At about $2 a box, that makes each pouch around 50 cents each. Not too bad. That's what I spend per yogurt cup too, because having individual cups is the only way to go according to my children. 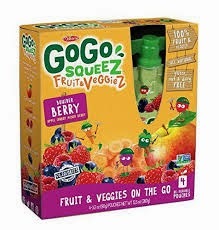 I'm sure I'll definitely be buying the other varieties of GoGo Squeez Fruit & Veggiez for my girls to eat!